Phagocytosis is an elegant, but complex process that cells use for the ingestion and elimination of particles larger than 5 mm in diameter. Unicellular organisms use phagocytosis to eat, while complex pluricellular animals have special phagocytic cells, which can phagocytize microbial pathogens, foreign toxic substances, and apoptotic cells. The Russian scientist Elie Metchnikoff originally described phagocytosis in the late 19th century. The scientific community of the time strongly opposed phagocytosis as part of their defense mechanisms, since the view was that only humoral elements were responsible for immunity. The importance of this cellular process has become evident with time thanks to the efforts of many dedicated researchers. Today, phagocytosis is recognized as a fundamental process not only for immunity, but also for tissue homeostasis. Because phagocytosis is a very complex process, its molecular bases are not completely known. This book represents an effort to introduce our present understanding of phagocytosis through the contribution of several brilliant scientists that actually investigate phagocytosis on a daily basis. 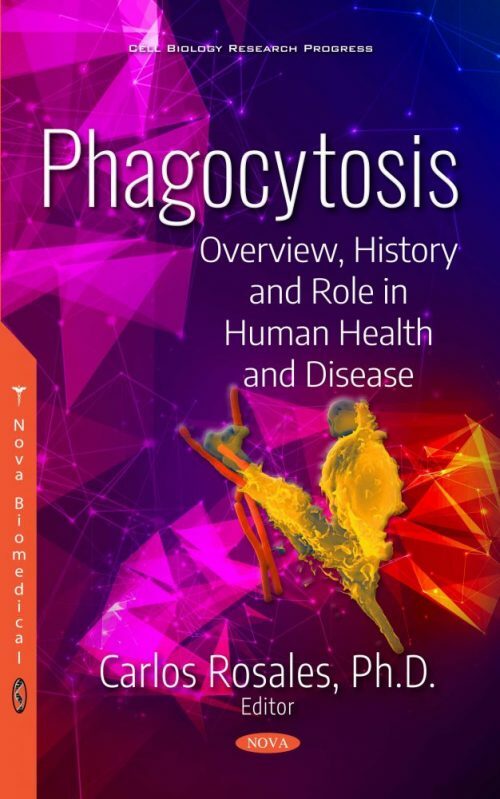 This book describes the history of phagocytosis and then the various steps of the phagocytic process from initial cell contact to phagosome formation, where the phagocytized particle is destroyed. Each chapter deals with one of these steps and emphasizes the molecules that participate at that step. The authors begin by describing the difficult origins of phagocytosis and how the cellular theory was finally recognized to be as important as the humoral theory of immunity. Next, the chapter “Receptor Signaling During Phagocytosis” talks about the signaling pathways of the major groups of phagocytic receptors, namely receptors for antibodies and complement. Then, the chapter “The Role of Phosphoinositides in the Formation and Maturation of Phagosomes” describes how these different membrane phospholipds regulate the changes in membrane composition during the process of phagocytosis. The following chapters deal with the mechanics of phagosome formation and membrane traffic for phagosome maturation. So, the chapter “Phagosome Formation and Sealing: A Physical Point of View” tells us about the cytoskeleton changes that bring about the closure of the new phagosome. The chapter “Vesicular Trafficking: Golgi to Plasma Membrane” describes the movement of internal membranes to the plasma membrane to allow the formation of the phagosome. The chapter “Retinal Pigment Epithelial Cells: Super Phagocytes with a Rhythm” describes an important example of how phagocytosis contributes to homeostasis. In the eye, the retinal pigment epithelium cells specifically phagocytize the photosensitive outer segment of photoreceptor cells following a diurnal rhythm. This contributes to the maintenance of a healthy retina. Finally, the chapter “How Do Microbial Pathogens Escape from Phagocytosis?” describes various mechanisms that some microbial pathogens have evolved to disrupt the phagocytic process and be able to survive in the host to perpetuate their infection. Each chapter can be read independently, but together all of the chapters offer a general view of phagocytosis. The book provides in this way a complete modern vision of this important biological function. Chapter 7. How Do Microbial Pathogens Escape from Phagocytosis? Audience: People interested in biomedicine, including physicians, biologists, biochemists, and researchers in the fields on immunology, physiology, metabolism, and cancer.